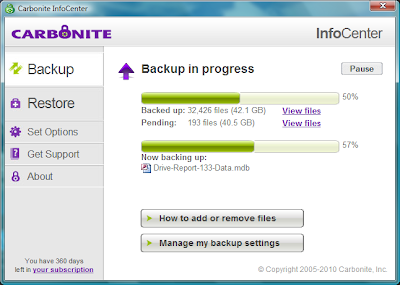 No sooner had the ink dried on my Carbonite review, than they updated their software. I guess that's the speed of the internet for you. The new version has a much better look, and is more useful. What I like the most is that there is now a progress bar that shows the current file it is backing up, and how far it has progressed. 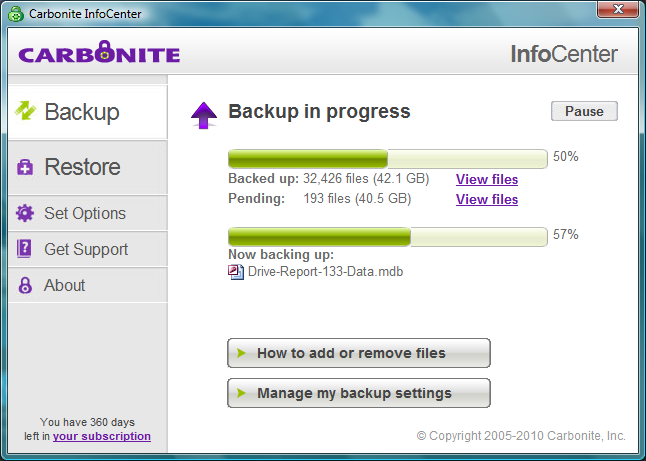 There are other useful things, like the ability to freeze your backup while you are restoring files to the hard drive. I learnt of the update because there was an automatic update message on my machine. If you haven't seen the message, just go to the Carbonite web site, log in to your account, and choose the "Reinstall" button, and run through the instructions on screen. Simple.